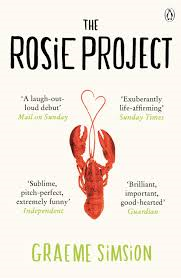 The Rosie Project by Graeme Simsion was my April book club read. Its narrated by Don Tillman, a lecturer in Genetics at the University of Melbourne. Don is almost 40 when he reads that married men are happier and stronger and so he sets off on “The Wife project” to find himself a partner. Having Asperger’s syndrome, Don is very frank, highly organised, very literal and quite direct. He struggles to read social cues, finds it difficult being flexible and generally has his life planned out by the minute. In steps Rosie who is everything he isn’t…with a zest for life, chaos and totally “messed up”, she turns Don’s life upside down when he decides to help her with “The father project”. He suddenly finds himself doing and being everything that he is not and he simply can’t help himself. I really enjoyed the book. While it’s a very easy read and quite funny at times, it also focuses on what so many of us might look at as “weird” in real life. You can’t help but warm to Don as he navigates through his emotions and thoughts to realise that although he may not understand what he is feeling, what he is feeling is love. Nectar1269, a Literature Festival sounds amazing! I really need to look into more events like these in London. Read this for book club too – likened Don to Sheldon in “The Big Bang Theory” – and had Jim Parsons (the guy that plays Sheldon) in my head throughout my entire read, despite the description of Don – please read the sequel and tell me what you think!